The fascinating story of the Glastonbury Lake Village can be viewed in the Tribunal, the 15th century merchant’s house in Glastonbury High Street. The Lake Village Museum presents an insight into everyday life in an Iron-Age settlement, dating from around 2000 years ago, when much of Somerset’s landscape was covered by marshy sea. Although these marshes have long been artificially drained, the excellent preservative properties of the peaty wetland soils in the Glastonbury area left an archaeological legacy of international importance. Made of bronze and beautifully decorated with studs, the Glastonbury Bowl can be viewed in the museum. It was discovered when a young Glastonian, Arthur Bulleid excavated the Iron age Lake Village on the outskirts of the town near Godney in 1892. 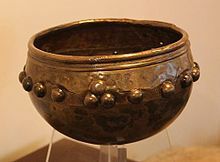 The bowl is made of two pieces, the lower being dated to the iron age whilst the upper, made from a single sheet of metal, is a later addition from the first century. It is a wonderful example of the expertise of these early local neighbours. The Glastonbury Bowl, together with many other artefacts including household implements and jewellery show the skill of these craftsmen. 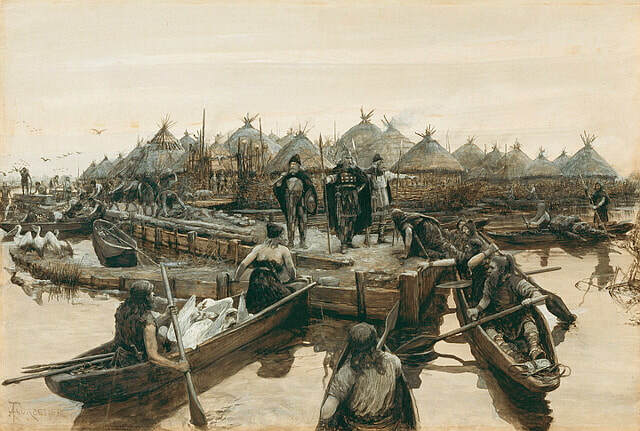 Unusually, many wooden pieces were found well- preserved due to lying in the peat beds including one of the dug-out boats used at the time to navigate the marshy area.